The Company Details window is displayed. 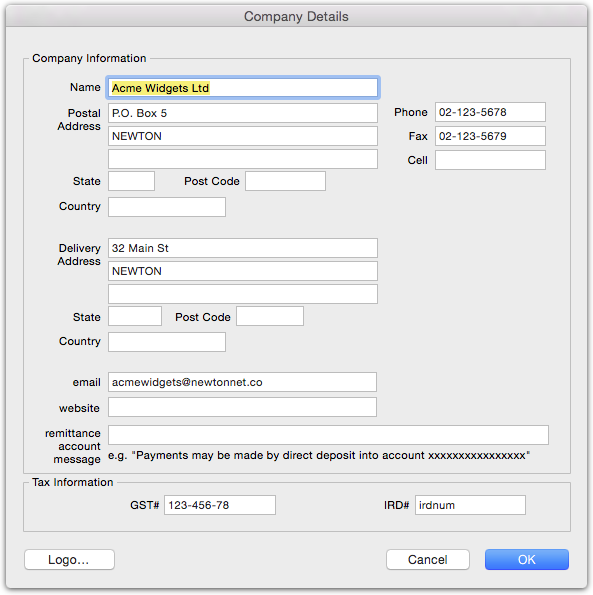 Remittance Message: This is the text to appear on your invoices and statements with your bank details to enable customers to pay by direct credit. website: The URL for your website, If this is a complete URL (i.e. includes the http://), it will be hot-linked when it appears in any PDFs. The tax fields will have labels appropriate to your country. Clicking Cancel will put the dialog box away without storing any of the data that you have added. Use the Cut or Copy buttons to remove or copy the stored logo for use elsewhere, or the Clear button to remove it altogether. Since the logo is for use at the top of reports, standard invoices and standard statements, it should ideally be about 3cm high and about 15cm wide, and should include your company name and address. The logo will be scaled to fit, retaining its original aspect ratio. Print this Logo; Turn this option on if you want the logo to be printed on the plain invoice and statement. Print Address & Phone Nos: Turn this option on if you want your address and phone details to be printed under the logo. You will need this if your logo does not include address information.